Home » Food and Nutrition » When It Comes to Protein Consumption, Should You Aim for a Number? When It Comes to Protein Consumption, Should You Aim for a Number? Protein can come from several different places in our diet, animal or plant. Animal protein includes fish, seafood, poultry, game, eggs, cheese, yogurt, milk, and red meat. Plant protein is derived from legumes and whole grains. Protein contains amino acids that serve as the building blocks of your entire body. From the smallest enzymic reaction to the building of muscle tissue and literally millions of different biochemical functions, amino acids are required. Even repairing our damaged DNA requires various types of protein molecules. 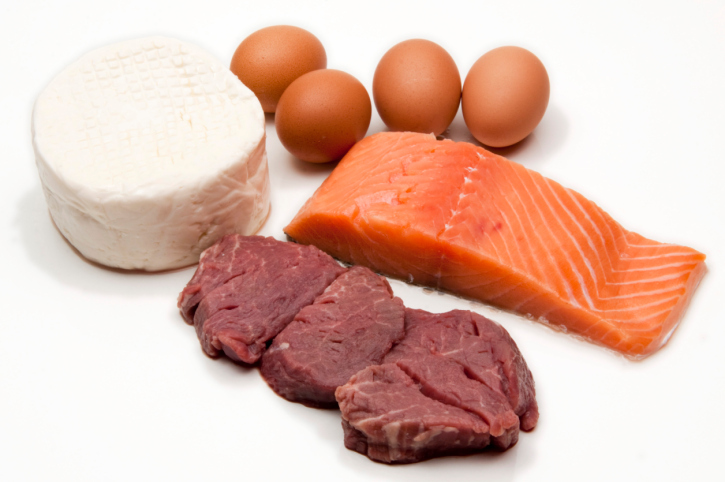 So, should you be concerned regarding the amounts of protein you consume on a daily basis? Well, that depends. Most people who call themselves experts will tell you that you can most certainly eat too much protein. Too much protein will cause you to gain weight or may even damage your kidneys. They also say that there is no real reason to consume more than the recommended amounts of protein each day. The recommended amounts of protein consumed daily are 0.8 grams per pound of body weight each day, which translates to approximately 56 grams for men and 46 grams for women. The trend in the U.S. is that men are currently eating almost 100 grams per day and women are consuming almost 70 grams per day. But the issue here is not the total amounts of protein that are eaten every day. The more important issue is the source of protein. Where is it coming from? What types of foods are being eaten to meet these daily requirements? Protein contains four calories per gram, but it affects your body much differently than carbohydrates, which contain the same number of calories by weight. As far as weight is concerned, the data clearly gives the edge to a diet higher in lean or vegetable protein compared to high-carbohydrate diets. Protein consumed from legumes, plain Greek yogurt, fish, poultry, low-fat cottage cheese, and eggs will not only decrease weight gain, but it will also increase body fat oxidation, improve insulin sensitivity, and reduce inflammation. In addition, the metabolic cost of processing protein from your diet is much higher than carbohydrates, so there is a great deal less protein stored as body fat. There is also evidence indicating that high-quality protein from dietary sources can regulate the hormone leptin in the brain, which prevents excessive hunger. If your kidneys function normally, higher protein consumed in your diet will not cause any degree of kidney damage. I would answer this by suggesting that a diet composed of higher amounts of lean proteins containing good, quality fats, nutrients, and antioxidants is an exceptionally healthier type of diet compared to high-carbohydrate, lower-fat diets. The Mediterranean diet comes to mind here. It is associated with a moderately high consumption of fish, seafood, goat cheese, and legumes. Not only is this diet healthy, but it also reduces many risk factors for chronic disease and improves longevity. Another caveat to consider: nutritional recommendations based on the requirements of an average cross-section of the population can be inaccurate, misleading, and confusing. It’s best to consider what you’re consuming (lean proteins) rather than sticking to a hard number. Klein, S., “3 Signs You Could Be Eating Too Much Protein,” The Huffington Post web site, June 12, 2014; http://www.huffingtonpost.com/2014/06/12/eating-too-much-protein_n_5481307.html.